Uncle Roy had these up today.......very cool in my opinon. Definately getting a couple. i plan to purchase one at least. very nice looking. looks like it can be a nice forestry dozer. does the winch actually work or is it just for show? Looks nice ill have to pick one up but what I'm really excited for is the PC300! Looks like its going to be great!!! Does anyone know when they are going to be released? Oh man the PC300 looks great! Damn those are nice. Looks like the 300 is a better model than the 330 but who knows, Like usuall I guess us Cat guys will have to wait to mid spring time to see the darn Cat models. Kenny ya lurker!!! Glad to see you back posting. I guess you saw it firsthand and can vouch for the detail, but both models look pretty sharp. Nothing against Cat, but it's good to see a few other nicely done machines out there in 1:50. It's also good to see that more of the commonly seen excavators are being done. (in regards to size) For me the largest machine I'd see on a daily basis would be a 30 ton machine, so it's nice to have/customize machines I'd normally see. Cant wait to see both either way. I couldn't agree with you more Dirtboy. Although I would like to say that after this run of models it would be nice to see something other than excavator models lol, I mean there are more machines out there besides them. I thought that those were new models when I saw them at Conexpo, now I remember seeing a prototype sign in the display cabinet as well. Kenny, they weren't selling any at the showm right? Because if they were then I would be kicking myself for not getting one, but I was pretty sure they weren't. I saw the WA 500's also, but I didn't think it was a new model, but it looked pretty nice and well detailed. 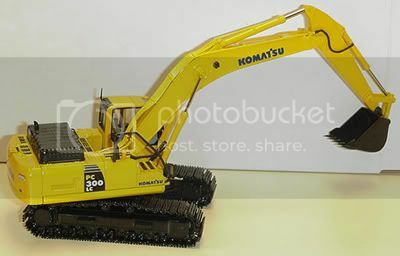 I'm not a big fan of those first 4 UH Komatsu models, but I might get that excavator, and maybe that dozer. The Komatsu store was pretty small compared to 2005, in '05 they had a hugeee store with a bunch of big tv's and those same simulator games, I remeber I got one of the PC 200's in '05.